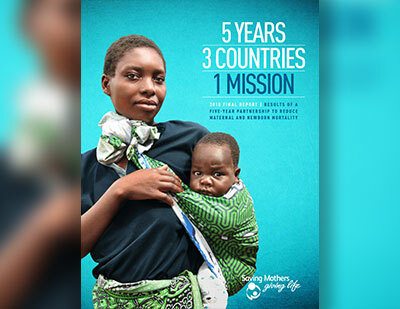 Five years ago, Saving Mothers, Giving Life (SMGL) – a major public-private partnership – set the ambitious goal of reducing maternal mortality by half in target districts in Uganda and Zambia, and later Nigeria. These are regions of the world with some of the highest rates of women dying from complications related to pregnancy and childbirth. Merck for Mothers is proud to have been a founding partner of SMGL and last month I participated in an event hosted by the Center for Strategic and International Studies to celebrate the partnership’s achievements and reflect on what we’ve learned. SMGL raised the bar high for a global development program because we wanted to show the world that with focused, concerted action we could make great strides in saving women’s lives. Five years later, I am pleased to report that we were successful. Maternal mortality in SMGL districts declined by 44% in Uganda and by 41% in Zambia – a remarkable accomplishment. And in just two years, maternal mortality declined by 28% in SMGL-supported facilities in Cross River State, Nigeria, where the partnership expanded after strong results in the initial two countries. Together, the U.S. Government, American College of Obstetricians and Gynecologists, Every Mother Counts, the Government of Norway, Project C.U.R.E and Merck for Mothers, as well as host country governments and dozens of implementing organizations on the ground, adopted a comprehensive approach to strengthen health systems. Our strategy enabled mothers and newborns to have access to the life-saving care they need, when they need it, leading to many more healthy moms and babies. At Merck for Mothers, we agree. As I think about our experience over the last five years, I am struck by the many lessons we learned from SMGL and how they have influenced the way we approach all our partnerships. Health systems strengthening is at the heart of the SMGL approach and the key to its success. But this herculean task – both in terms of effort and investment required – is not something that any one organization can take on alone. One of our critical learnings from SMGL is that when diverse partners are at the table, it is important for each of us to identify our distinctive value to ensure that we are contributing more together than we would individually. As the leading private sector partner, we saw an opportunity to bring our business mindset to the challenge of sustainability to ensure that these lifesaving programs continue. For example, we supported the development of two dozen mothers’ shelters in Zambia. These residences are located near health facilities where women can stay during the late stages of pregnancy, childbirth and the immediate postpartum period to overcome distance barriers that women often confront in accessing quality maternity care. We supported projects that trained community members in entrepreneurship, business management and financial literacy, building local capacity to operate the shelters in a financially sustainable way. Today, half the cost of these shelters is covered through a diverse and creative range of income-generating activities, like mill grinding and goat rearing. Even the women staying there participate in activities like gardening to contribute to the shelters’ operations. Another insight from the SMGL partnership is the importance of investing in generating evidence, which is critical for learning and course-correction. SMGL – through the CDC – conducted a rigorous baseline assessment of maternal and newborn mortality at the beginning of the partnership so we could track progress along the way and make sure our efforts were actually saving lives. And now, SMGL is one of the first large-scale initiatives for which we have population-level impact data and an analysis of progress over time. Data-informed solutions are a cornerstone of Merck for Mothers. For example, evidence generated through SMGL proved to us that we need to break down silos between public and private maternity care and look at the total health care market. Today, we are applying this broader approach in our programs in Nigeria as well as in India and other countries. SMGL’s success shows the power of a broad coalition in providing the resources needed to achieve scale, especially when it comes to major infrastructure investments that are not otherwise possible. At the same time, SMGL is an important example of effective stewardship of resources. The partnership was able to combine public and private support and unleash new capital to address a persistent global health challenge. Based on our experience, Merck for Mothers has joined additional partnerships with USAID and others that focus on innovative financing of maternal health solutions to encourage and reward results and sustainability – for example, the Global Financing Facility to close the funding gap for maternal and child health and the Utkrisht Impact Bond to improve quality maternity care in India. We believe that the SMGL model is a blueprint for how other countries can improve maternal health in alignment with the Sustainable Development Goals. From the start, SMGL partners worked closely with the governments in all three SMGL countries and aligned our efforts with national and state plans to encourage government ownership for sustainability. Now, the wide variety of strategies SMGL deployed serve as a “menu” of options – with evidence to back them up – that countries can adapt and make their own to improve health outcomes that extend far beyond maternal health. I am convinced that if we take this approach forward, it will lead to further gains in maternal health for years to come. At Merck for Mothers, we will continue to use the lessons we learned from SMGL as we forge ambitious and innovative partnerships to save women’s lives. To learn more about SMGL, please see the initiative’s final report.